Cuir am bùntata do phana le uisge agus salann agus leig leotha bruich fhad ‘s a tha thu a’ deasachadh na gritheidean eile. Geàrr an stoc a-mach às a’ chàl-cholaig, ach fàg an càl-colaig fhèin ann an aon phìos. Rùisg an stoc agus cuir am pàirt geal às a’ mheadhan, ann an dà no trì pìosan, do mhàs a’ phana. Ma bhios duilleagan òga ùra ann, nach eil ro thiugh, cuir iadsan dhan phana cuideachd. Còmhdaich an stoc agus na duilleagan le salann agus uisge teth às a’ choire – ach 1 – 2 òirleach a-mhàin; bidh an càl-colaig a’ bruich san smùid. Cuir an càl-colaig air muin nam pìosan-stuic, agus còmhdaich e le mullach a’ phana. Thoir chun a’ ghoil e agus leig leis earr-bruich mu 7 – 10 mionaidean gus am bi an càl-colaig al dente. Thoir sùil air gu tric – chan fhaod e fàs ro bhog! Anns an eadar-àm sgrìob an càise. Nuair a bhios am buntàta agus an càl-colaig deiseil, tilg iad ann an sìoltachan. Geàrr am buntàta na dhà leth agus sgaoil iad air màs soithich-quiche. Brìs an càl-colaig ann am pìosan agus cuir e am measg a’ bhuntàta. Sgap cuid mhath den phiobar dhubh gharbh-bhleithte air, sgaoil an càise thairis air, agus mu dheireadh dòirt an t-uachdar no Alpro air a’ mhullach. Cuir fon ghrìosach gus am bi a h-uile rud òir-dhonn. Ma bhios tu ag iarradh rudeigin nas susbaintiche, faodaidh tu sliseagan beucoin a chur air. Nuair a bhios buinneagan-Bruisealach ri fhaighinn, bidh iadsan uabhasach blasta seach càl-colaig san reasabaidh seo cuideachd, gu h-àraidh leis a’ bheucon. Faodaidh tu broccoli a chleachdadh an àite no còmhla ris a’ chàl-cholaig. Put the potatoes in a pan with water and salt and let them cook while you prepare the other ingredients. Cut the stalk out of the cauliflower, but leave the cauliflower itself in one piece. Cut off the tough skin of the stalk and put the white middle part in the bottom of a pan, cut into two or three pieces. If there are any tender fresh young leaves, put them in the pan too. Add salt and cover them with boiling water from the kettle – only 1 -2 inches; the cauliflower will cook in the steam. Sit the cauliflower on top and put the lid on the pan. Bring it to the boil and then simmer for 7 – 10 minutes until the cauliflower is al dente. Check frequently – it mustn’t get too soft! When the potatoes and the cauliflower are ready, turn them out into a colander. 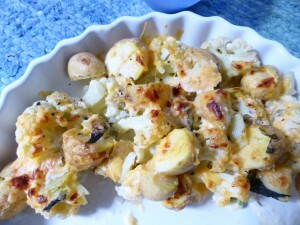 Cut the potatoes in half and spread them over the bottom of a quiche-dish. Break the cauliflower into pieces and spread them among the potatoes. Scatter the rough-ground black pepper over it all, then the cheese, and finally pour the cream or Alpro over the top. Place under the grill until golden brown. If you want something more substantial, you can add bacon rashers to the topping. 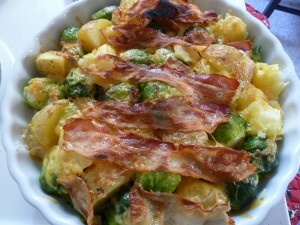 When Brussel sprouts are in season, they are extremely tasty instead of the cauliflower, especially with the bacon. You can also use broccoli as well as or instead of the cauliflower.